The 6 week Summer holidays are starting in earnest this week in the UK and I know this might sending a lot of parents into panic mode, thinking about how they are going to fit everything in/keep the kids entertained/stop the house from falling apart! So in order to do my bit to help I have put together a Summer Holiday Survival Sheet on a single sheet of A4. Meaning you can stick it on your fridge for quick reference! And should you feel that everything is going off the rails you can refer to the sheet, take a deep breath and steady the ship! It has all the Mind Body Soul stuff on there PLUS all of The Organised Mum Method and there is room for you to fill in an activity each day for the kids. Why not get them involved in picking some stuff they want to do over the Summer? Watch this space because I will be sharing lots of free/cheap things you can do over the Summer so you don’t have to go into the Autumn with an unhealthy bank balance! Because you know what starts in September don’t you? Yes, that’s right … it is the return of Organised Christmas !!!!!! 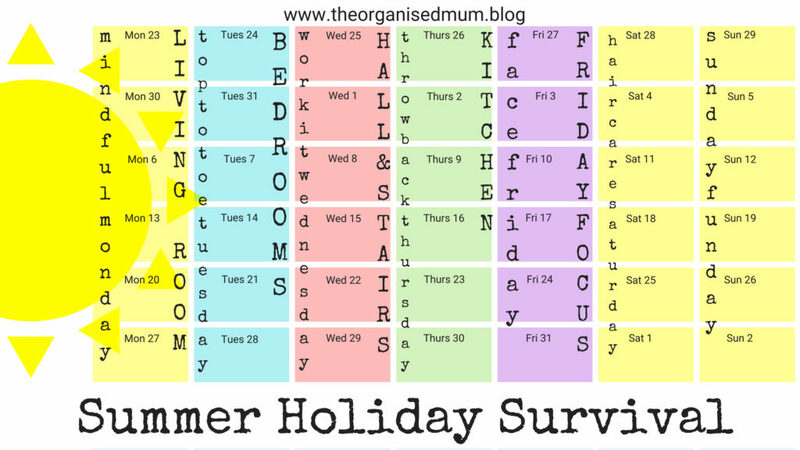 And if you are going away for your hols then don’t forget the Organised Holiday Plan!